We have a reason for every choice we make in life (either a rational or an emotional one). When it comes to applying for a job, however, most of us do not care much about the name of the company. We submit more job application, trying to improve our chances of getting a job. Doing anything else would be utterly illogical. Nevertheless, HR managers prefer to hire people who have some knowledge of the company, and have on their mind a good reason of their choice. 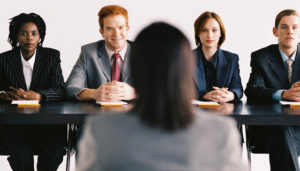 Interviewers do often consider their company the best one in the market. Though (typically) far from the truth, in a good answer you should compliment them for something, suggesting a reason why you would prefer to work for them, and not for one of their competitors. A good pre-interview research should help you finding the answer. I really like your vision and working environment, especially the ecological aspect of your production. There aren’t many companies that pay attention to ecology in this particular filed of business. I would be proud of working here. I have researched about your company. You have a great reputation, a wonderful brand, and your reward program really stands out. That’s why I want to work for you, and not for another company in the city. Remember: Compliment them for something – for their goals, vision, philosophy, working environment, or anything else you like. That is the best strategy of winning them over.